Gameplay: This point and click game comes in 2 CDs and need CD1 in the CD-Rom drive to play. The Main Menu has the new game, load-save game, continue, second chance, game setup, credits, help and exit game. Game setup has voice, music and special effects volume control and closed captioning. Help has directions on how to play the game and other information. After clicking on New Game, select the level of gameplay as senior or junior level. Click on Gameplay overview to learn how to navigate throughout the game and the different settings in the game. There are unlimited save game slot in this point and click game. This walkthrough describes both junior and senior detective. The sequence shown is not necessarily the only way to get through with the game. The game is not linear in most parts. The gameplay puzzles are the same in both senior and junior level. The junior level has a checklist and hints can be obtained by calling Bess Marvin. This game can be played in any order. This walkthrough is just one way of gameplay. Nancy was invited by the Hardy Boys to join in a train trip to Blue Moon Canyon. The other guests are John Grey, a ghost hunter; Charleena Purcell, a romance book writer and Tino Balducci, a policeman. The hostess is Lori Girard, who explains the reason for the invitation to go to Copper Gorge in Colorado and her restoration of Jake Hurley's train. Jake's wife, Camille died in the train. The train was found abandoned in Blue Moon Canyon in the middle of Nevada desert. The engineer was found dead and no traces of Jake. Lori wants the guests to find Jake's lost mine. The train passes through a tunnel and Lori disappears. The train comprises of the engineer's car, coal bin, dining car, sleeping car, Camille's car, Jake's car, the caboose and the lounge car. Talk to Charleena. She doesn't remember Nancy at the Shadow Ranch episode. Talk to Joe and Frank Hardy. There is a pencil in inventory. Kitchen - Go forward to the kitchen and use the phone to talk to the engineer. Look at the stove and see a square and a duck on the stove door. The exit is closed because the train is moving. Look at the pipes and wheel right of door. It is a steam valve. Read the warning to not open unless the pipes are connected. Dining room - Open the trunk right of the entryway and see a Salmon ad from Flippy Fin's - Fresh from a hand from the deep and the pictures of fins. Turn right and click on the picture of the eagle. We'll get back to this puzzle later. Look close at the shoes on the chair. The shoes are both left feet and have a Sadie Crawford label. Bar - Talk to Charleena and learn about Jake and his wife. Turn right and click on Jake and Camille's portrait left of the entryway. Learn of Camille's love of singing and dancing and her visitations after her death. Exit to go to next car. Cell phone - Use the cell phone and call Bess Marvin - click 'dir' and select Bess Marvin. Then click 'dial'. Learn about Lori and update the girls. The cell phone has camera to take pictures and menu to view pictures. In junior level gameplay, hints can be asked of Bess. Look close at the mountain goat's left eye - some kind of gemstone. At the right wall is the emergency brake. If you pull the lever of the emergency brake, game ends. Look close at the table on the other side. Floral tiles puzzle - Click open the drawer of the table and see disarranged tiles that are a replica of the tile on top of the table. The object of the puzzle is to arrange the tiles to be similar to the one on top of the table. Right click to rotate tiles. Click hold a tile and drop it over another tile you want to replace. Take the paper and read: 'Left pick ax and lamp with Buell for safe-keeping. To open what's closed, lead is the key'. Go to the other end of the car pass the sleeping rooms. Note the framed 'A Tale of Two Dolls', a poem about Yawning Alice and Edna the Terrible. Click on the grate close to the floor at other side of the train. You need 4 numbers to unlock the tumblers. Another puzzle to get back to later. Exit to the next car. Go forward to the end of the car and enter room at right. Talk to John Gray and learn about ghosts and Tino. Look around. Yellow couch - Take the #7 slug and read The Little Book of Samplers. Note the common motifs and their meanings. Turn left. Trunk on floor - Read the paper behind the trunk - 'Sickly Sara caught a germ so new. It made one of her pretty green eyes to blue'. Camptown Races - Look at the horse jumping game on the table across the couch. When 'I did it' is said - take the Camptown Races music sheet. Note the notes at bottom of music sheet. Plaid box - Go left, turn around and look close at the plaid box on the chair. Read the Krolmeister (I thought they're a nail factory) certificate for a doll named Teddy Eberhardt. Piano - Place the Camptown music sheet on the piano and try to play. Oops, we'll wait until John is not here. Corner table with box - Go to the corner and look close at the locked box. Open the drawer and see the piano notes that identify the keys. Look close at the blue hair ribbon - Thomasina O'Neill. Ornate grill - Look close and click on the ornate grill below the sampler and the different looking bolts. It needs a special tool. Sampler - Look close at the sampler and take note of numbers associated with symbols-pictures. Note the train cars. The next car has owl and cherries. A red headed Awful Ursula is sewn at the center of the sampler. Exit and go to the next car. Enter the room on the right. Talk to Tino. Take the #3 slug. Look around. Note that a pick ax is missing from the tools behind Tino. Go left of the desk, turn around and click on the purple gem on right leg of the cougar statue. Periodic table - Look close at the things on top of the table-bookcase at middle of room. Read through the Gemstone book to identify the different gems. Click to look close at the picture of the 2 dolls beside Camille - Hagar Anderson with suspenders and Chantilly Hildegard in a full skirted dress. Look close at the cigar box with Ag above the ornate colored petals lock. Hmm..., need more data. Look above and click close to read that Ag is silver. Go to the table opposite the periodic table. Look close at the stamp on the right and note JH stands for Jake Hurley. There's a Leaping Lizard game on table. Go to the globe and see another gemstone on the base of the globe stand. Look right of the sofa and read the certificate for Eliza Sandberger, a doll with red ribbon. Exit the room and go to the end of the car. Scale - Look at the locked door right of the scale built on the wall. Open the caboose door using the scale and slugs - The door has an owl and cherry on it. Look close on the scale and see that the owl and cherry symbols are above red bulbs. The object of the puzzle is to light up the bulbs under the desired picture when slugs are placed on the right and/or left pan. The correct number of slugs is based on the position of the symbol-picture. If the picture is in second position, 2 slugs are needed or if the picture being worked on is on 4th position, 4 slugs are needed. Each symbol-picture has a number connected to it as shown by the sampler. This is the number that should be the result of the subtraction of the slug numbers on the left and right pans. This is shown by the number at the center between the pans. Go to the sampler in Camille's car and see that the owl is 7 and cherries is 10. Place one slug on either pan to light up the first symbol. Since the owl is the first on the row and the number on the sampler is 7 - place the #7 slug on either pan. See that the owl is lit. Now, we need 2 slugs on the pan to light up the second symbol, the cherries. Since the sampler number for cherries is 10, place the #3 slug to add to the #7. Hear the door open. 'That square and the duck look very familiar'. Remember the oven. Pull back and go through the now unlocked door. Tool chest - Look close at the tool chest on the right. Open the drawers. Take the #8 slug from the top drawer. Pull back to close drawer. Read the paper from the second from top drawer. It states: Silver is orange, blue, green, red, purple, yellow. Plan - Open the third from top drawer and lift the base to get a plan of the machineries in the room. Steam is needed to power the machineries. Also needed are spyglass, pickaxe and a map. The gems: citrine, amethyst, zircon, peridot, tiger's eye and tourmaline are also needed. Keep a lookout for those items. Open the bottom drawer and read both sides of the torn paper. It mentions that Naughty Tina doll's face was cracked. Machineries - Look around at the different machineries. See where the pickaxe should go. Click on the wheel and look close at the machine that opened up. The lamp and the spyglass go on the 2 bowls at end of the arms. Look at the middle machine with 6 arms. This is where the gems are placed. Wonder what goes on the flat topped machine on the right. Open the Chinese pagoda stand by the door and see 8 lettered squares. Another set of puzzles for later. Tile door puzzle - Look close on the left of the ornate locked gold door. This is a memory puzzle. The object of the puzzle is to depress all the tiles by pressing a sequence of tiles. This is a random puzzle. Find one tile that stays pushed in when clicked on. Then look for the second tile that stays pushed in after the first tile is clicked on. Find this by clicking on first pushed in tile and click on other tiles until you get both tiles to remain pushed in. Then click on the first and second tiles again to depress them and look for a third tile that stays pushed in. Do this until all 9 tiles are depressed or pushed in. The door unlocks. Go to next car. Well, well, well. Look who's here! Take Jake's letter to Ruth Kensington. Learn Lori's version of this trip and about her guests. Read Jake's letter. To get to the mine: need a map and the projector has to be functional. The placement of the stones is known by someone who holds a warm place in my heart. But to get to his name, the dolls have to ordered. To order the dolls, the name of Camille's dancing shoes has to be known. Then do her favorite steps on the dance floor. Camille's four words are also needed to power the projector. Rub off - that's a clue, eh. Name of Camille's dancing shoes - Turn around and go right to the dance floor. Take the dancing shoes and look close. Call Bess on the cell phone and ask about the maker of the shoes. Take a picture of the shoes by clicking on 'cam' button, move the square to center on the shoe label and then click. Press the 'send' button and then press 'send' again when Bess' name is selected. Look around the room. See a hutch with glass door and a locked drawer across from the dance floor. Look close and open the trunk left of door. Take the socket wrench. Look at the head of the wrench and see the familiar shape that was on the bolts of the grate in Camille's car. Letter stand - Look close at the Chinese pagoda stand right of door and see letters on the panel. Word Search Puzzle - This is like the newspaper word search puzzle. Look for words and then click on each letter to form that word. The letters must be adjacent to each other. Then do the next word and so forth. Based on Jake's letter, we need to look for Calico, Silverado, Central City, Dodge City, Virginia City and Tombstone. Click on the letters until only 8 letters are left. If a wrong letter is pressed, press it again to deselect it. All that's left is: n v r z t b a a. 'Guess I'm done'. Exit the lounge car to go to the caboose. Nancy states 'that must be the projector Jake's letter mentioned to Ruth'. Turn right and see the stand which also has a Chinese pagoda decor. Chinese pagoda stand - The letters from the Chinese pagoda word search puzzle at the lounge car must be the letters to be added here. Enter: n v r z t b a a. Wow!!!! Look at that - we got the map! Now we need to make the projector functional. For that we need steam power and placement of jewel from a man we need to get the name from. The name is from order of dolls and the doll order needs the name of the dancing shoe maker. Call Bess and find out the name is Chaussettes Chatoyantes. Go to Jake's car. Jake's car: Talk to Tino. Nice job! Look close at the cougar's gem. Cigar box - Look close at the cigar box under the Periodic Table. Look for Ag on the periodic table and see that it is silver. Remember the paper seen in the second from top drawer of the tool chest at the caboose states: Silver is orange, blue, green, red, purple, yellow. Look close at the colored petals wheel of the cigar box. The colors can be rotated by the turn arrows when the cursor is place on the side of the lock. Pushing the center gold part resets the puzzle. The color under the arrow on top is entered when the arrow is clicked. Rotate the petals to place the silver colors (orange, blue, green, red, purple, yellow) under the arrow: orange under the arrow at top, click arrow, blue under the arrow at top, click arrow, green under the arrow at top, click arrow, red under the arrow at top, click arrow, purple, click arrow, yellow petal under the arrow at top, click arrow. Take the colored petal wheel. Open the box and read the letter about the lamp from Thomas Willson. The lamp needs carbide. Take the dance step diagram of the Hurley's Whirly Burly. Grill pipes - Look close at the grilled cover on the wall right of the entryway. Arrange the pipes so that all the pipes are connected. There all done! Take the tiger's eye gem from the base of the globe. Go to the lounge car. Lounge car: Go to the dance floor. 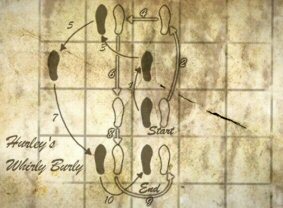 Dance step puzzle - Follow the Hurley's Whirly Burly dance step diagram by clicking on a shoe and then clicking the shoe on a square you want it to go. Click on the dance shoes and then click on the dance floor to start the puzzle. The hutch opens. Pick up the tourmaline dropped from the hutch. Doll puzzle - Open the hatch and see the dolls. The object of the puzzle is to arrange the dolls to spell the name of the dance shoe maker. The first letters of the names of the dolls make up Chaussettes Chatoyantes. The dolls can be identified based on the description of where the name are seen and some other characteristic. Open the drawer and take #1 and #2 slugs. Look at some old pictures pasted on a paper. Go to Jake's car. Scale for square and duck - The stove in the kitchen has a square and a duck on the door. Based on the sampler, the square's number is 4 and the duck is 1. They are the 3rd and 4th light, so there's a need to use only 3 slugs and then 4. Place 3 + 8 on one pan and 7 on the other. This lights up the square. Place 1, 2 on the pan with 3 and take out 8, leaving 7 alone on the other pan (1 + 2 + 3 on one pan and 7 on the other). This lights up the duck. Dining car: Go to the kitchen in the dining car and on the way, you might see a ghostly figure in one of the windows. What is that! Talk to Charleena completely. Talk to the Hardy Boys at the dining room especially about the engineer and Buell. See the picture of Buell's shop at Copper Gorge. Go back to the bar but turn around first on the entryway. Click on the button under the dining room table and see how the bookcase moved and how Lori disappeared. Talk to Charleena again. Stove in Kitchen - Click on stove door and read the work pay receipt for James Thurston, the engineer. Thurston is the someone who holds a warm place (stove) in my heart. Phone - You might want to call the engineer every once in a while. He might be lonely alone in his cab. Talk to the Hardy Boys about Lori and Charleena. Look up and click on the chandelier above the dining room table. Take the zircon gem. Talk to Charleena and learn about a storyline taken from Lori's idea. Talk to the Hardy boys again about James Thurston. Sleeping car: Take the olivine (peridot) green gem from the left eye of the mountain goat. Camille's car: Look at the picture of Jake and Ruth on the wall. Ornate grill screws - Look close at the grill below the sampler. Use the socket wrench on the screws to open the grill. The object of the puzzle is to turn the screws to get the single line on the screws to even up to the line on the grill. Turning one screw might turn itself or up to 3 screws at a time. Check which screws affect what other screws. Then turn the screws to point to the line on the grill until all screws are done. Pull out of the puzzle resets the puzzle. Screw 1 turns 1 and 5, 2 turns 2 and 3, 3 turns 1 and 3, 4 turns 2 and 4, 5 turns 5, 6 and 8, 7 turns 7 only and 8 turns 7 and 8. Turn screws 4 2 3 1 5 6 8 7 until the lines are aligned. Grill removed. Ornate grill pipes - Arrange the pipes so that all the pipes are connected. Align the 5 pipes by the side outlets. 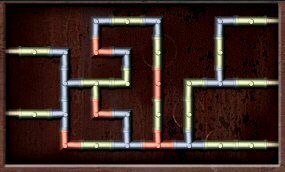 Then arrange the blue pipes (3 clicks), then do the red pipes (1 click) and lastly arrange the light green pipes individually. Here we go! Talk to John especially about the glowing lights. Talk to Tino at Jake's car. Talk to Lori at the lounge car. Oops! Somebody threw the emergency break (can happen earlier or later in the game). Talk to the Hardy Boys. Talk to Charleena. Look at the emergency brake at the sleeping car. Talk to John in Camille's car. Call Bess on the cell phone. Talk to Tino at Jake's car. He shows a thermometer that he found and blames John for the emergency brake incident. Look at the Gem book and see that peridot is a form of olivine. Talk to Lori. Talk to John and hear a recording. Ask him about the thermometer. Take a look at the packing material of the thermometers by the trunk on the floor. Go back to Jake's car and look at the same packing material on the floor by the desk. Nancy should say something about the packing material. Talk to Tino. If he doesn't want to talk before you ask about the thermometer - take a walk around and then comeback and ask him about the thermometer. He will later admit to the emergency brake fiasco. Talk to the Hardy Boys about James Thurston, the engineer. This will trigger the arrival at Copper Gorge. Talk to whatever this miner is. He, she, it is a descendant of the Buell that Jake knows. Look around and play the games. Gold Rush - The object of the game is to get the prospector up the mountain before the yeti. The prospector climbs up when the released balls enter in the yellow holes of the donkey and dynamite. If the balls go through the pink holes of the villain and snake, the prospector goes down. Click on start and pull the lever at right. I did this puzzle using single ball (slow clicks) or shower of balls (fast clicks) released. Either one works well on replays. Take the gold nugget token. Horse race - The object of the puzzle is to get a horse of your choice to the finishing line. Selecting the winning horse is a game of chance. Select a horse by pressing a number, pull the start level and watch. Play until you win. Happee Taffee - Insert the 2 different tokens and take taffee on a stick. Jake's trunk - Look around and check the trunk by the employee's door. Talk to the proprietor about the trunk and Charleena's auto-graphed. Talk to Charleena about Fatima. Now to look for a pen. Pen - Ask John and then Tino about a pen. Tino wants you to best his score on the Leaping lizard game. Leaping lizard game - The object of the puzzle is to remove balls and to have less than 5 balls remaining. Remove a ball by jumping a ball over that ball to an empty space. Keep the remaining balls as close to each other so that they can be removed later. Empty one group of balls at a time. Talk to Charleena and take the auto-graphed picture. Go back to the museum. Before you can talk to Fatima, the Hardy Boys talk about finding the descendant of James Thurston, the engineer. Frank will work as a short order cook. The other characters left to look for the mine and they are gone from the train. Go back to the train. Note: Go to Camille's car first and do the piano puzzle before going to Jake's car for the jewel. Camille's car: Go to the piano now that John is not here. 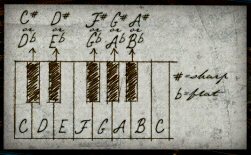 Camptown piano puzzle - Play the music sheet taken from the horse jumping puzzle. Review the scales on the drawing at the drawer on the corner table. With the music sheet on the holder, click on piano keys. Click on the keys: G G E G A G E E D F E D C.
Jake's car: Go to the mining tools behind the desk and look close at the Carbide can. Open the can and take carbide. While at left of the desk, look close at cougar and take the amethyst. Talk to John in Camille's car. Talk to Charleena. Go back to town. Click on cemetery in the mountain left of the screen. Talk to the creepy voiced caretaker. He dropped the crypt key on the grate. Look close on the grate in front of the door and see the key. Pull back away from grate. Use the taffy on the stick on grate and then on the key. Take crypt key. Use crypt key on keyhole. Crypt - Once inside, take the #6 slug from left side of steps. Go down. Camille's tomb - Look close and note the word Copper over the familiar indentation. Pull back and look up on the color table above. Click on Pb (lead) and note the colors: red, green, blue, orange, yellow, purple. Nancy should say Pb. Look at the Cu (copper) colors: green, red, purple, yellow, orange and blue. Look close at tomb and place the colored petals wheel on the indentation. Rotate the petals to place the copper colors (green, red, purple, yellow, orange and blue) under the arrow: green under the arrow at top, click arrow, red under the arrow at top, click arrow, purple under the arrow at top, click arrow, yellow under the arrow at top, click arrow, orange under the arrow at top, click arrow, blue petal under the arrow at top, click arrow. A secret drawer pulls out. Take the citrine gem. Look-click at the 4 posts at each corner of the room. Hear Nancy talk about rubbing. Museum: Talk to Fatima. Hot dang! Jake's trunk - Remember the note taken from the flower tile puzzle at the sleeping car. It states: Left pick ax and lamp with Buell for safe-keeping. To open what's closed, lead is the key. So lead means the element lead or Pb. The colors of Pb are seen in the color chart in Camille's crypt. Place the colored petals wheel on the indentation. Press the center to reset the puzzle. Rotate the petals to place the lead (Pb) colors (red, green, blue, orange, yellow, purple.) under the arrows: red under the arrow at top, click arrow, green under the arrow at top, click arrow, blue under the arrow at top, click arrow, orange under the arrow at top, click arrow, yellow under the arrow at top, click arrow, purple petal under the arrow at top, click arrow. Take Jake's lamp and #10 slug. Talk to Fatima about the pick axe. She wants you to do something for her. Taffy Sorting puzzle - Enter through the Employee's only door beside Jake's trunk. Take some wax paper from the table after permission is granted. Look at the taffy machine on the left. The object of the puzzle is to click-grab the good taffies and place them in their correct boxes above. Allow the 'rejects' to pass through to the end of the conveyor belt. The taffy to be sorted are green apples, yellow bananas, blue blueberry, purple grape, orange mango and red strawberry. The rejects are smaller or have spots. Press the start button and good luck! No eating taffy while working. Talk to Fatima again. Take the pick axe. Exit museum and the cell phone rings. Talk to Frank at the Burger place. Hamburger puzzle - The object of the puzzle is to fill up the order seen on the order ticket hanging on the left. 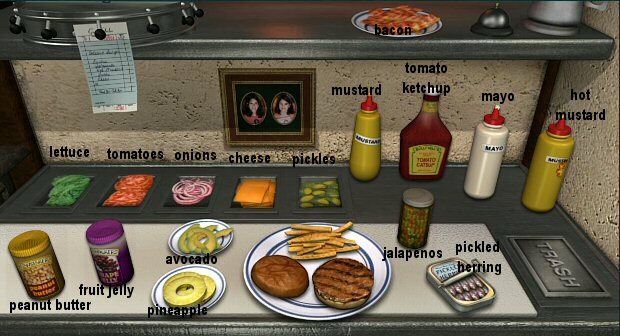 Make the burger by clicking on an ingredient and then click it on the burger. When done click the bell at top of the counter. The wrong ingredients can be thrown in the 'trash' at bottom right. Volcano Burger - Onions, jalapenos, hot mustard, bacon, cheese. Ring bell. Listen to the old man talk about Jake Hurley. Classic Burger - Lettuce, tomato, pickles, mayo, ketchup. Ring bell. Listen to the old man talk about Jake's wife. Hayashi Burger - Avocado, tomato, fruit jelly, pineapple, cheese, mayo. Ring bell. Listen to the old man talk about how James Thurston died. Colossal Burger - Everything minus the p's: pickles, peanut butter, pineapple, pickled herring. Ring bell. Listen to the old man talk about Jake Hurley's mine. Chef's choice - Make a burger that you want. Ring bell. Listen to the old man talk about how to find the old mine. The eye of the tiger is fixed on a star. Zircon lies in finger that scar. Amethyst floats in a hand from the deep. Citrine is what the fowl mouth shall keep. Tourmaline by a soft arm is ensnared. Peridot rests at the foot of the mare. Talk to the Hardy Boys about what Frank heard from the engineer's son. Jake is Mark Twain aka Samuel Clemens' pen pal. The wheel in the kitchen requires that all the pipes are connected. The pipes in Jake's car and also at Camille's car are now all connected. The ones at the sleeping car and at the dining car have to be connected. Unlock the eagle's picture - Check the number of the eagle on the sampler and find out that it is 2. Go to the scale at Jake's car. To unlock the eagle picture, 6 slugs are needed that end up with a math answer of 2. Place 10 + 6 on any pan. Place 1 + 8 + 2 + 7 on the other pan. Go to the eagle picture at dining car. Pipes behind eagle picture - Arrange the pipes so that all the pipes are connected. 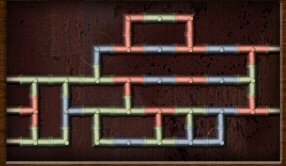 Arrange the blue ones (2 clicks) then the red ones (one click) and lastly arrange the light green pipes individually. 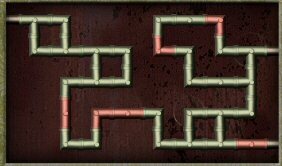 Pulling back out of the pipes resets the puzzle. 'There that looks right'. Camille's crypt - Go to Camille's crypt at the cemetery. Make rubbings of the 4 posts at the corner - Click wax paper on the circle and then click the pencil on the wax paper. Do this to all 4 posts' circles. 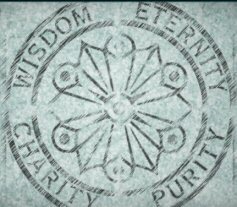 Read: Wisdom, Charity, Purity and Eternity. Camille's car - Read the sampler book on the couch and note that wisdom is symbolized by an owl, charity is symbolized by a dove, purity by harp and eternity by crown. Go to the sampler on the wall and see that owl is 7, dove is 9, harp is 3 and crown is 6. Sleeping car grate - Click to open grate and see the 4 numbered tumbler. Enter the 4 numbers derived from the rubbings taken at Camille's crypt: 7 9 6 3. The sequence is based on the decor ration of the lid of the tumblers. (Thanks, Niki.) See another set of pipes. 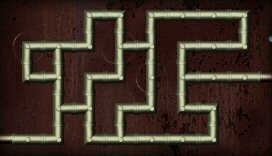 Sleeping car pipes - Arrange the red pipes first (3 clicks) and then arranged the light green pipes individually. 'That should do it'. Kitchen: Go to the wheel by the door. Turn the wheel. If all the pipes are connected, hear steam goes through the pipes. Pickaxe - Go left as soon as you enter the caboose and insert the pickaxe in the holder. Click on pickaxe. Oh No! It broke. Duct tape is needed. Talk to Tino and then ask John for duct tape. Monastery old box puzzle - The object of the puzzle is to bring all 3 animals from left to the right shore. Start with the animals from the left shore. There are 3 animals: wolf, puma and peacock. The puma will eat the peacock if left alone with it. Click on the tiles to tell a story that is in correct order. Take duct tape. Second machine - If you have not turned the wheel yet, click on wheel by left wall to open up the 2 armed machine. Place the lamp on the left holder. Based on the Willson's letter, the lamp needs carbide. Click carbide taken from the can behind Tino on the lamp. Place the spyglass on the right holder. Jewel placement - Go to 6 armed machine on the right. Click to open each of the holder of the 6 armed machine. Place the gem following the description stated by Thurston's son - The eye of the tiger is fixed on a star. Zircon lies in finger that scar. Amethyst floats in a hand from the deep. Citrine is what the fowl mouth shall keep. Tourmaline by a soft arm is ensnared. Peridot rests at the foot of the mare. Click the base to close the holder. Rotate the arm of the machinery by clicking on turn arrow when cursor is placed on the side of the holder. Map was placed earlier on the long table after the correct letters were added on the Chinese pagoda stand. Pick axe - Fix the pick axe with the duct tape. Click on pick axe and if steam power is on, all the machineries are done and the map is in place then all the lights turn green. 'And we have liftoff!' WOW! Brimstone Canyon! Go forward twice and the train leaves Nancy alone in the canyon. Go forward pass the cannon and see that the mine entrance is blocked. Go back to the cannon. Cannon puzzle - This is a random memory puzzle just like the door puzzle to the lounge car. The object of the puzzle is to depress all the clips by pressing a sequence of clips. Find one clip that stays pushed in when clicked on. Then look for the second clip that stays pushed in after the first clip is clicked on. Find this by clicking on first clip and click on other clips until you get both clips to remain pushed in. Then click on the first and second clips again to depress them and look for a third clip that stays pushed in. Do this until all 6 clips are depressed or pushed in. See the cover of the mirror removed and the boulders blocking the mine is blast off. Enter the mine. See that the colored wheel points to a certain color. Go forward and see colored glowing lizards on the walls. Let's investigate first. Fish - Go forward to the entrance where the orange lizard is located. See a water pond that has a plank with a symbol. Look close at the plank and see a fish swim by. Turn around and exit. Take the right path with a purple lizard on the right. The wheel points to red. Go forward. The wheel is yellow. Go forward once, pan right pass the orange lizard and forward to yellow lizard. Fire - Enter the alcove and see a fire pit with markings. Jake must have made those symbols. They are numbered with Roman numerals 1-6. We already saw a fish close to a plank with a symbol. That must be #5 and this fire pit is #2. Pull back and look close at the symbol on the plank left of the chair. 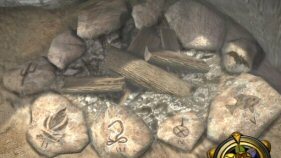 So, each numbered rock describes a place that has a plank with a symbol. Turn around and exit. Pan right and take the exit with the orange lizard. Go forward to an elevator set up. Hanging boulder - Look close at the plank with symbol right of a hanging boulder. This must be the #4 etched on the fire pit rock. Turn around, forward once and turn around again. Enter the elevator. Pull down the lever once and then pull it down again to get to the second lower level. Saguaro cactus - Exit and forward until the rock that looks like a Saguaro cactus is seen. Go left and see the plank with symbol. This must be the #1 shown by the rock at the fire pit. Turn around and see an entrance on the wall. It must be a tunnel to get up to the upper level but it is too steep. Go back to the elevator and push lever to go up one level. Snake - Go forward and see a plank with a snake symbol. Cross the snake plank and turn around. Look close at the symbol on the plank left of the snake plank. This must be #3 of the fire pit stones. Pull back, turn around and go forward. See a red lizard on the left path and purple on the right. Take the left with the red lizard. Turn around and see the entrance on the right that goes down to the lower level where the saguaro cactus stone was seen. You don't need to go there anymore. Turn around again with the red lizard on the left and purple on the right. Take the left path with the red lizard. Go forward to the blocked rail track. Turn right and forward to the processing machine. Go forward to the purple lizards. Bat - Go forward until the yellow lizard and the last plank. Look close at the last plank with symbols. This must be #6 on the rocks at the fire pit. The bats will be heard later inside the cave. Go forward and see the planks with symbols. Jake left the clue on how to move them using the rocks with numbers depicting the places where the planks are located. 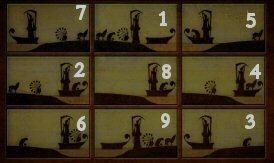 Click on the planks with symbols in the order shown by the numbered rocks. Go forward. Jake Hurley: Look close at Jake's skeleton. Click on what he is holding - Camille's picture. Take what is underneath Camille's picture. Read the letter. It is from President Abe Lincoln on the day he was assassinated. This letter must be worth a fortune. Listen to the villain and the dastardly plan that was hatched. Nancy is trapped. Escape the mines: Turn around and ride the rail car. Rail car ride - Place the cursor at center of the screen. Every split in the rail track is preceded by a skull sign. As soon as the right or left arrow appears, click to make a selection where you want to go. Take the right, right, right, left and left fork on the rail track. Watch the ending with villain in the mud and the appearance of the Hardy Boys. Nancy reads the update on all the characters. Watch for Nancy Drew 14: Danger by Design set in Paris.